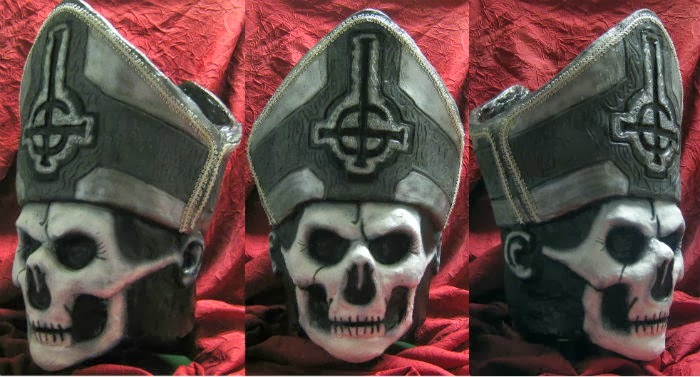 it's been a long, long time in the making but screwbiter is mondo proud to bring the Official Papa Emeritus II mask! 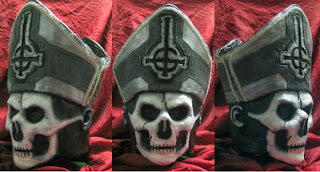 Papa II is the current incarnation of frontman for Swedish band Ghost (or as they are known trademark wise in the states "Ghost B.C."). sculpted by myself pulling inspiration from both the actual mask used in live performance and album artwork, this bad boy is limited to 250 pieces world wide and available NOW in the mask shop! each piece is hand numbered, and 13 specially selected numbers (of occult significance) will be known as "Ghostly Papas" and they feature a glow in the dark skull finish. Demand is expected to be high, and I anticipate many sleepless nights in the shop!